Keep America Beautiful celebrates its 65th anniversary of improving communities across America. STAMFORD, Conn. December 17, 2018 /3BL Media/ – On this day in 1953 – Dec. 17 – the iconic national community improvement nonprofit organization Keep America Beautiful was founded when a group of corporate, civic and environmental leaders gathered to unite the public and private sectors to foster a national cleanliness ethic. 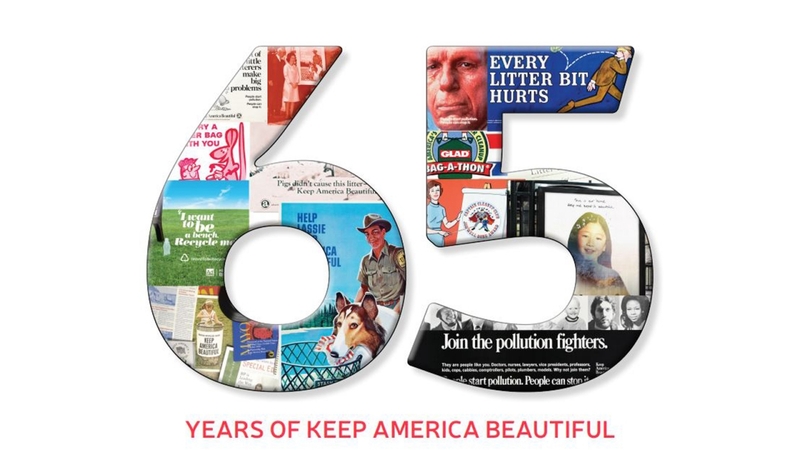 Sixty-five years later, the remarkable scope and influence of Keep America Beautiful still touches millions of Americans every year in its effort to end littering, improve recycling and beautify America’s communities. In celebration of its 65th anniversary, Keep America Beautiful reintroduced itself to America with a new public service advertisement (PSA) – “Let’s Talk About America” – which made its national launch earlier in 2018 and has been seen in more than 180 media markets with more than 30,000 airings, resulting in more than $20 million in donated media. The PSA’s national network TV airings include FX Networks, Cooking Channel, DIY Network, Food Network, Fox Business Network, HGTV, Golf Channel and The Travel Channel. In addition, out-of-home placements have appeared in settings such as the Port Authority Trans-Hudson (PATH) rapid transit system. Keep America Beautiful is demonstrating to a new generation of community stewards — those who were not alive when the historic “People Start Pollution. People Can Stop It.” campaign was released in the 1970s — that it continues to make a substantial economic, environmental and social impact. To celebrate the anniversary while evolving into the future, Keep America Beautiful also launched a new brand identity, including its #DoBeautifulThings mission video, symbolizing the organization’s commitment to create cleaner, greener and more beautiful communities. The nonprofit emerged around the time when the newly-developed national highway system was experiencing significant littering by motorists. Keep America Beautiful responded with 20 years of public service messaging with the Ad Council. Keep America Beautiful, in 1971, became a part of advertising history with one of the most powerful public service announcements ever created: the landmark “People Start Pollution. People Can Stop It.” The PSA resonated so deeply that the campaign is credited with waking the environmental consciousness of an entire generation. Since it first aired, the PSA has been seen by millions of people around the world. As the public service campaigns influenced the behavior of Americans and made Keep America Beautiful synonymous with local cleanup efforts, the organization’s focus expanded to embrace other elements of community improvement. Behavior-based research became a priority in 1968 as Keep America Beautiful conducted a national study of litter’s origins and causes. That research became the foundation for the Clean Community System, which evolved into the present-day Keep America Beautiful Behavior Change System. In the 1980s, as Keep America Beautiful transitioned from a public awareness campaign to a national community improvement system, city and town improvement organizations started to adopt the Keep America Beautiful Behavior Change System to develop and implement behavior change programs to reduce litter and change attitudes about solid waste. Keep America Beautiful’s national network of community-based affiliates now number more than 600 in communities large and small across the nation. Keep America Beautiful volunteers take part in cleanup, recycling and beautification programs that positively affect the quality of life where they live and work. Local economies are buoyed as communities become more environmentally healthy, socially connected and economically sound. Millions are educated in the successful implementation of the Keep America Beautiful proven behavior change programs. These programs include the Keep America Beautiful signature event – the Great American Cleanup, which is the country’s largest annual community improvement program. Entering its 22nd year, this program mobilizes more than 3.5 million volunteers and participants who take part in more than 20,000 hands-on projects targeted at areas of greatest need in communities large and small, urban and rural. In 2017 alone, the Great American Cleanup resulted in 6.7 million pounds of litter and debris being collected across more than 71,000 miles of roads, riverways and beaches. America Recycles Day, a Keep America Beautiful national initiative is the only nationally recognized day focused on recycling. Taking place on and surrounding Nov. 15, America Recycles Day recognizes the economic, environmental and social benefits of recycling, and provides an educational platform to raise awareness about the value of reducing, reusing and recycling – every day – throughout the year. The Keep America Beautiful education platform includes Waste in Place, an elementary school curriculum supplement that has been reaching students and teachers since 1979. These environmentalists of tomorrow are taught the sense of individual responsibility for and ownership of one’s local environment that is the hallmark of Keep America Beautiful. Keep America Beautiful Recycling Tips for the Holiday!